Over the course of three visits to Jamaica from 2005 to 2008, Thomson meets an amazingly diverse range of people to try and make some sort of sense as to why Jamaica's post-independence experience since 1962 has been so disappointing for nearly all Jamaicans. Here he confabulates with musicians, church leaders, radio DJs, politicians, gangland dons and returnees to Jamaica, most of whom had spent time in the UK, whilst also gaining the perspective of ex-pats who chose to leave the country years ago, when Jamaica was in the throes of its mass exodus in the 1950's and 60's. Seeking out these people, Thomson travels around the country frequenting some of the more seedier places of downtown Kingston, religious institutions, Rastafari communities, police stations and 2am street parties ("passa-passa") while under the protection of drug dons, which provides him with unique insights on which to cover off a vast amount of ground and topics on past and present-day Jamaica. Chief among these is the role that slavery has played and is now interwoven into the social fabric of the country, right down to the corruption of the main political parties and how olde time Jamaican values have been replaced by a ghetto life which is now controlled by heavily armed gangsters pedaling drugs. What The Dead Yard describes is a place where lawbreakers are themselves the lawmakers, both on the streets and in parliament. At the time of independence, the homicide rate in Jamaica was 4 per 100,000 inhabitants, although by the time Thomson had visited this had soared to 50 per 100,000 (1,500 people per year killed in a population of close to 3 million). Unfortunately, things have not improved since then. The latest UNODC statistics detail Jamaica's homicide rate in 2015 as 43 persons per 100,000 - higher than South Africa's 34 and across the globe only better than the abysmal rates of El Salvador, Honduras and Venezuela. However, The Dead Yard is not entirely focussed on the gangland violence that dominates Kingston. It also devotes itself to telling the back story of a myriad of ethnic groups such as the Maroons, Chinese, Jews, East Indians, Scots and Germaicans, that all make up Jamaica today. 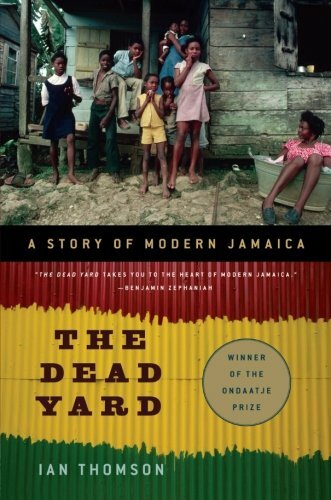 Alongside insights provided on how Jamaican people are revealed in their music through ska, rocksteady, reggae, dancehall and toasting, The Dead Yard brings to life the places of Kingston, Trench Town and Spanish Town from which most of us would only ever have heard in popular song. Thomson's critical account of Jamaica saw it awarded the Royal Society of Literature’s Ondaatje Prize as well as the Dolman Travel Book Award. Due to its alleged “sensitive content”, it was also rumoured to have been banned in Jamaica, or at the very least, due to the risk of libel action, bookstores chose not to stock it. I always find these sorts of bans, somewhat self defeating as invariably all it seems to do is whet people's appetite guaranteeing subsequent purchase! The Dead Yard is by no means a dreadlock holiday. There are some heavy themes surrounding slavery, killings, drugs, homophobia and gangs that are as far away from the great tourist tracks as you can get. But by visiting them, we gain a much greater understanding of Jamaica's people, its history and maybe even some insights into its future.